Viva La Vegan! - 500km walk for the animals ends with a Party in Byron Bay! 500km walk for the animals ends with a Party in Byron Bay! I have a close friend, Jodi Ruckley, who is an inspiring lass. She's been a vegan animal activist for years and spends her time in Australia and France spreading the vegan message however she can. Jodi has recently started a not for profit group Our Place on Earth and aims to open an animal sanctuary around Northern New South Wales as soon as she can. One of the ways Jodi has been spreading the vegan message the past few months is via a 500km walk (which is just over 310 miles) from Australia's capital, Canberra, to end up at Byron Bay Saturday 2 July. 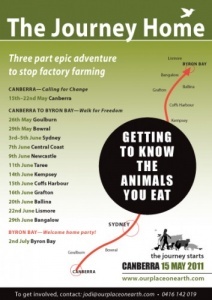 When Jodi mentioned to me a few months ago that she wanted to do a walk to raise awareness for factory farmed animals from Australia's capital, Canberra, to end up near her hometown in Byron Bay and travel along the East Coast of Australia we brainstormed how this walk would be able to have the most impact and who to involve. Jodi and I are similar in the ways that once we decide on something we want to do it, then we find a way to make sure it happens. While I am more of a planner and a thorough organiser, Jodi intuitively knows when the timing is right and does it then. Jodi has had help from many vegan companies and businesses and been joined by some other activists along the journey but this is definitely Jodi's walk, and it would have been undertaken with just herself and her dog friend, Wayne if needed. Jodi takes some time out to answer some of my questions. At Our Place on Earth we use creative solutions to enable human and non-human animals to coexist peacefully, and that encompasses a wide range of projects ranging from my recent book release, video, workshops and events like the Walk for Freedom. Ultimately I believe there is real power in people getting to know the animals they eat and recognising that cows, pigs and chickens have an incredible amount of wisdom to share with the human race. That's why we aim to run a rescue and rehabilitation program for farm animals, so they have the opportunity to share their true selves with more and more people, especially the younger generation. Why did you decide to do a walk in the coldest time of year in Australia? I make decisions intuitively (and last minute), it just felt right to get on and do the project as soon as possible, and ultimately it has worked out well, it would be sooo hot walking in the animal costumes at any other time of the year. Did you undertake any training beforehand? I did a couple of token walks of about 7km, the first one out on the Pacific Highway near where I live in Mullumbimby when it was pouring with rain and close to dusk. It was great to know what it would be like in the worst conditions, it was kind of fun and gave me confidence that the walk would be fairly easy. I did research and was grateful to find out two pair of socks is the go - it really works. What were your main aims on the walk? The first part of the walk we spent time in Canberra with our Animal Embassy tent where we wanted to get the issue of factory farms on the agenda of the government. I see it that they are supposed to represent all Australians, including those who are locked in factory farms. 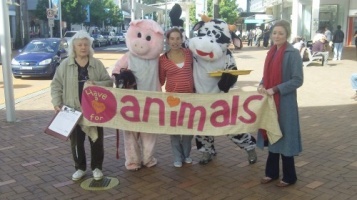 We then walked and walked between towns giving away free vegan treats and conducted silent protests at factory farms, saleyards and abattoirs. I believe it's important to concentrate on the outcomes we want, that's why we pay our respects to the animals on the way and let them know there are people who care. Plus we demonstrate to the the public how tasty living a compassionate lifestyle can be. The last stage is quite different, now we are in the hometown of where Our Place on Earth operates. Its about celebration, coming together, teamwork and looking forward to a new way of living - a life where people and animals can live in harmony. How long have you been vegan and why is being vegan important to you? I have been vegan for 11 years and vegetarian for 26 years. I have always had a deep appreciation and respect for animals, to me being vegan is the ultimate action of kindness that I can make for animals. In a lot of ways it is a sacrifice, a sacrifice I make very easily. I do it every day for my love for animals. What were people’s reactions to your outreach, your outfits and your message? We got a lot of great feedback on how tasty the vegan products were, particularly the vegan hotdogs and Bounty Burgers. In some towns, like Goulburn, people were a little surprised, in Kempsey they thought we were strange yet determined (it was raining very hard that day), in most places they loved us. 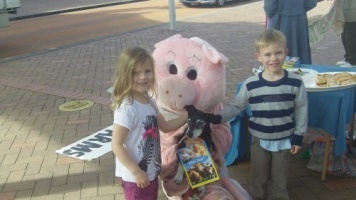 We had a lot of meaningful chats and so many kids got so excited by the sight of the animal costumes and loved having their pictures taken with them. Your timing was great with all the media surrounding the live export of animals to Indonesia. Did many people comment about this? Yes, constantly. I was astounded by how many people watched the program, and so grateful to how many hearts it has touched. Many people were commenting on wanting to go vegetarian, so it was great to be able to follow up and give them information on how they can go about it. People really care about animals and are starting to get the link between meat and animals on their plate. It's so important we are out there supporting and guiding anyone who would like it. How do you measure the success of the walk? I think it's been great, every leaflet handed out is always a success - you never know where that will lead. I will always remember a good friend of mine telling me that someone handed him an animal rights leaflet on the streets of Sydney, it changed his life. 30 years later he has done an incredible amount of work for animals, from being president of the Vegan Society in NSW to writing many books on the topic. I wish that person who originally gave him the leaflet knew that she had such an incredible impact on someones life and for the animals. It has also been great to see how much support we have had. So many different companies have donated products, and so many people have helped out in such different ways, it's always so nice to be part of a strong level of teamwork. On a personal level it has also been very profound. I love walking rather than driving a car and I feel it is giving me the confidence to step towards life without a car again, walking and biking is just so much more rewarding on so many levels. Are you looking forward to normal life after the walk and how will you celebrate your return? I have a feeling my life is never going to be normal again. I am so looking forward to the party, we have people coming from all parts of our journey like Canberra, Sydney, Newcastle, Coffs Harbour, friends from Northern NSW and SE QLD as well. It is going to be such a great day and will be a great opportunity to look back at all we have achieved and just relax and chill out with friends and meet new people. Friends have been organising the welcome home party and I understand there will be a great line up of music, workshops and there is going to be loads of free yummy vegan food. Farm animal rescue and rehabilitation will start the week before the party, so I am looking forward to a very different life. I have dreamed of living with cows, pigs and chickens for many years and that dream is about to come true. I look forward to spending loads of time with them and understanding more deeply how we as human can help their respective species. What are some other effective ways other people can help the animals? 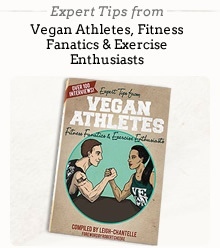 I believe people should use their own strengths, passions and drive - whatever inspires them to help animals. We all have different talents, and we all use them in different ways. I encourage everyone to just go for it, our animal friends await us to join forces and make this planet a better place for all species. Deep down I have always wanted to do animal healing. On this trip I have been gaining insights and the confidence on ways to pursue this. I am currently studing small animal naturopathy, and have also decided I would like to study Vet Science in the not too distant future. I will start practising on a small scale with the skills I have in the near future. What else? There is so much. I have just started a school program called Animilia so I want to build and grow this program, my recently launched book Through the eyes of a cow is being translated into French, so I will be brushing up on my French skills with that and I am off to France for a few months to run various workshops relating to animals and also promote the film we made The animals you eat which was shot in France. The priority of cause will be the rescued animals, ensuring they have the best life possible and really gaining insights how to create a property where they feel truly free. 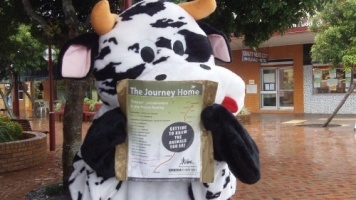 The Journey Home Welcome Party will take place at ThreeWorlds, Bryon Bay on Saturday 2 July. Jodi and her animal friends hope to see you there! See the FaceBook event for more information and how you can help. The party will be preceded by a silent protest at SunnyBrand chicken Abattoir on Ewingsdale Rd at 10am sharp. Contact Jodi for more information.